Sometimes, when it’s cold (relatively speaking, I live in Southern California after all!) and chilly outside, all you want is a little bit of comfort food. Winter months are great for enjoy a bowl of hearty soup. Soup is filling, and warm and comforting and some times just a reminder of home during the long, dark nights. 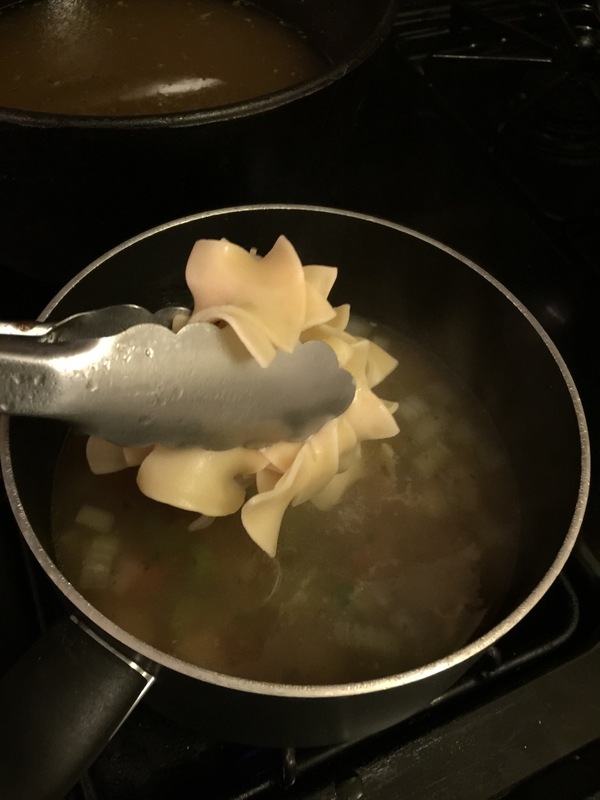 So, one night, I got it in my head to try to learn how to make homemade chicken noodle soup. I’ve never done anything like this before, but I figured, how hard can it be to make chicken noodle soup? People make it all the time, and it is definitely the ultimate comfort food. While this is homemade chicken noodle soup, I didn’t actually make it all from scratch. I used a leftover whole rotisserie chicken, and a package of store-bought egg noodles. I never said this was made-from-scratch chicken noodle soup, just that it was homemade. Let’s start with the whole rotisserie chicken that I bought to eat for a different meal. 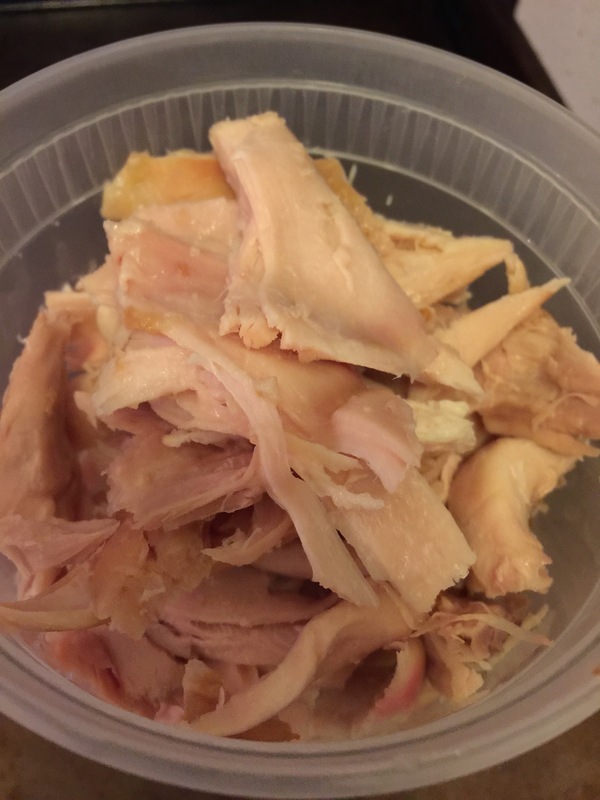 I pulled the rest of the chicken meat off the bones and set the meat aside in a separate bowl to be used later for the soup. Before there can be chicken noodle soup, we need to make the broth. Cut up the ingredients for the chicken stock that will go into making the soup broth. We need a few basic ingredients for the stock, and that includes onions, carrots and celery. These three items are the base of flavoring for the chicken stock. We also need a few basic herbs, that includes some parsley. Fresh is always better than dried. 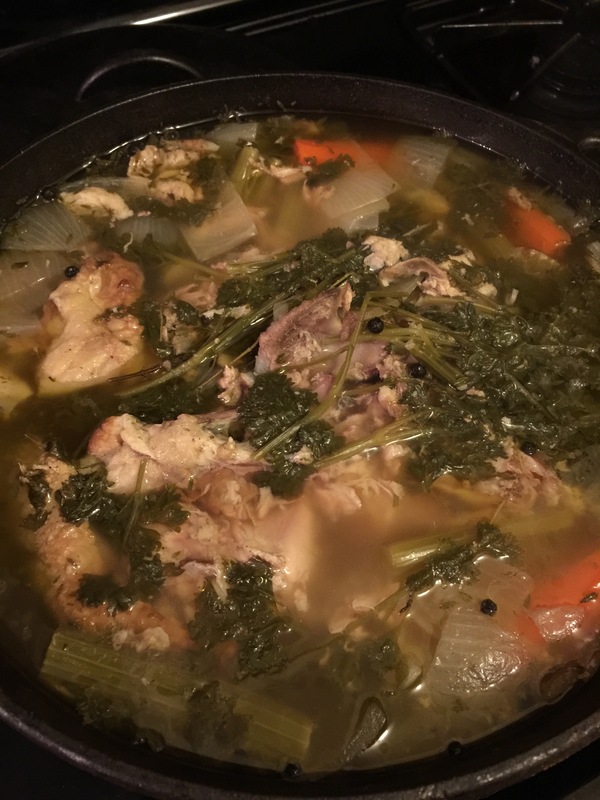 Into a dutch oven goes the whole chicken carcass. If there’s still some chicken meat left on the bones, don’t worry. Once we’re done with the chicken carcass, the chicken meat will just fall off of the bones. 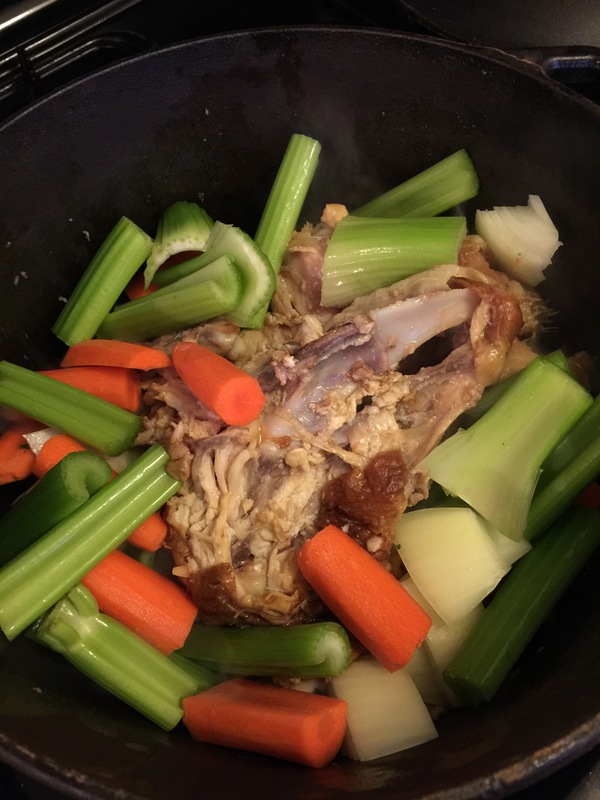 Along with the chicken carcass, throw in the celery stalks, carrots and onions. To the dutch oven, add in a quart or two of cold water. Just enough water to cover the chicken carcass and the vegetables. You definitely don’t need to fill the entire dutch oven with water. 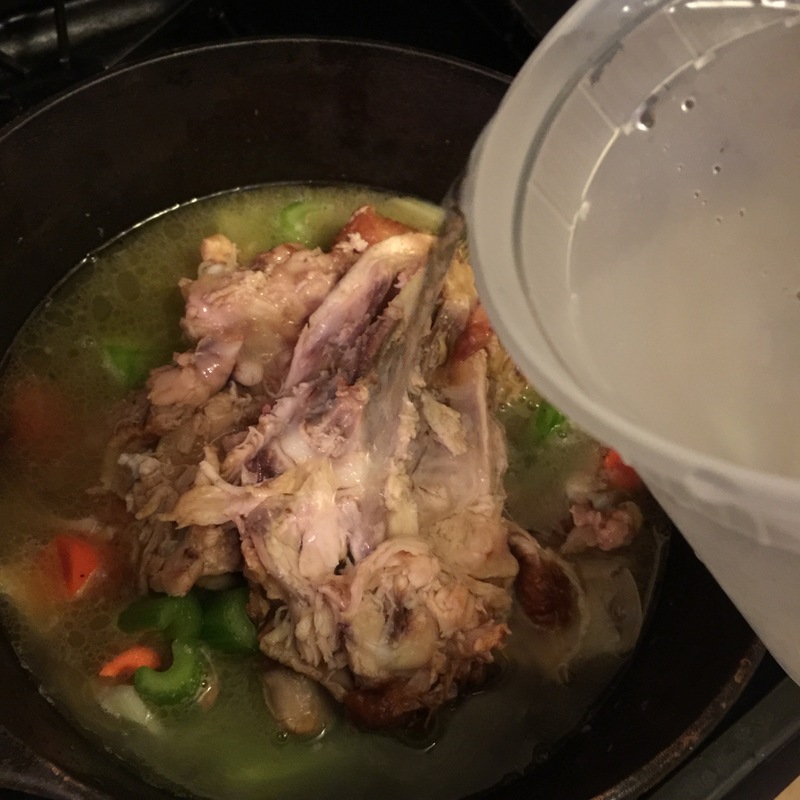 The less water you use, the more concentrated your chicken stock will be when done. 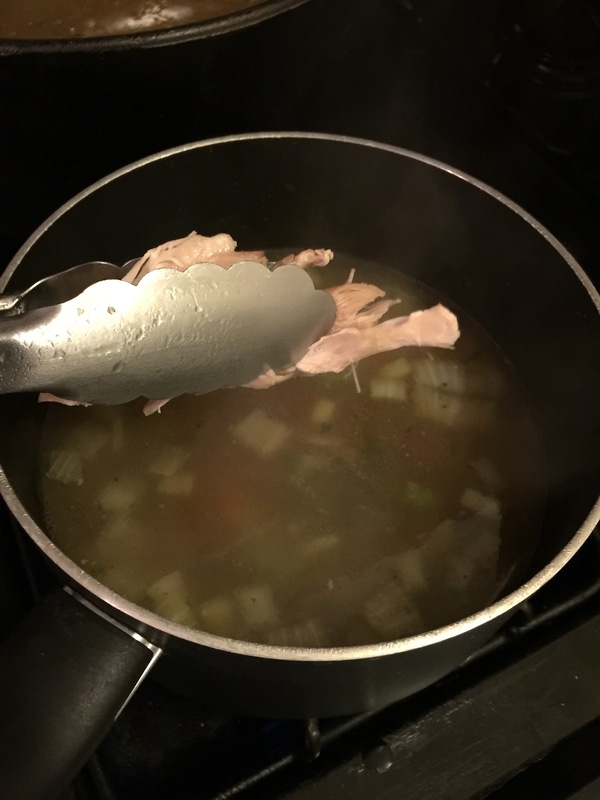 The more water you use, the more diluted the chicken stock and hence you’ll not be able to taste the rich flavors of the chicken and the vegetables. The final few ingredients to be added to the pot now. Throw in the fresh parsley. Add this of fresh thyme as well for a woodsy, earthy flavor. 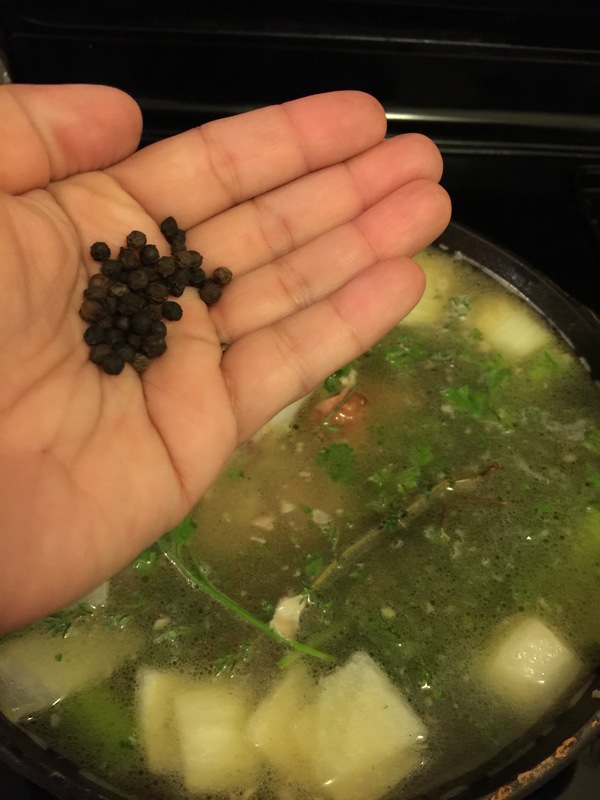 And finally, add in a handful of whole black peppercorns for some added spice to the chicken broth. Bring the pot up to a boil and then lower the temperature on the stove down to a simmer. Cover the pot and let the stock simmer for a couple of hours. This infuses the flavor of the herbs and the vegetables and the chicken into the stock. The stock starts to reduce and concentrate. After a couple of hours, the celery and the carrots start to get mushy and opaque. The onions have long since turned translucent. 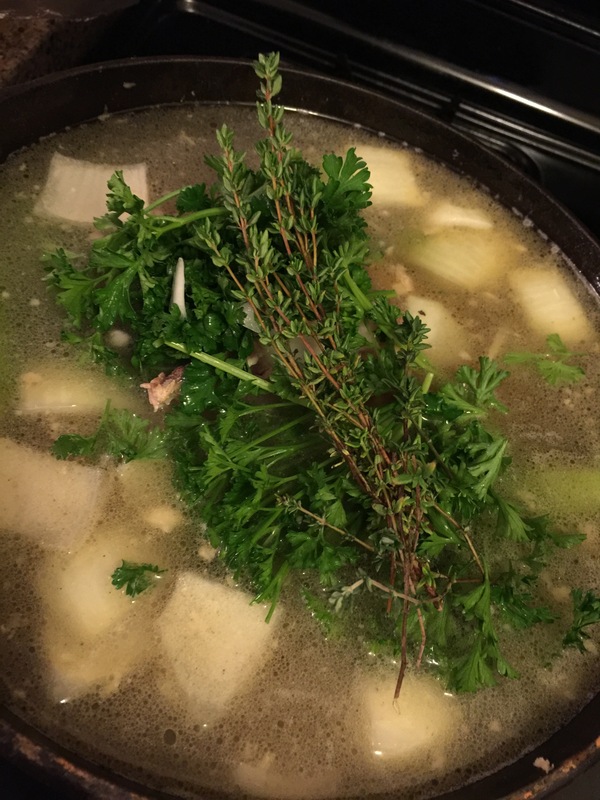 The remaining meat on the chicken carcass has started to just fall off the chicken carcass itself, and all of the fresh parsley and thyme has turned an ugly dull, dark green color. Your chicken stock is ready. The next step would be to take the carcass out and take off any of the remaining chicken meat that can you salvage. 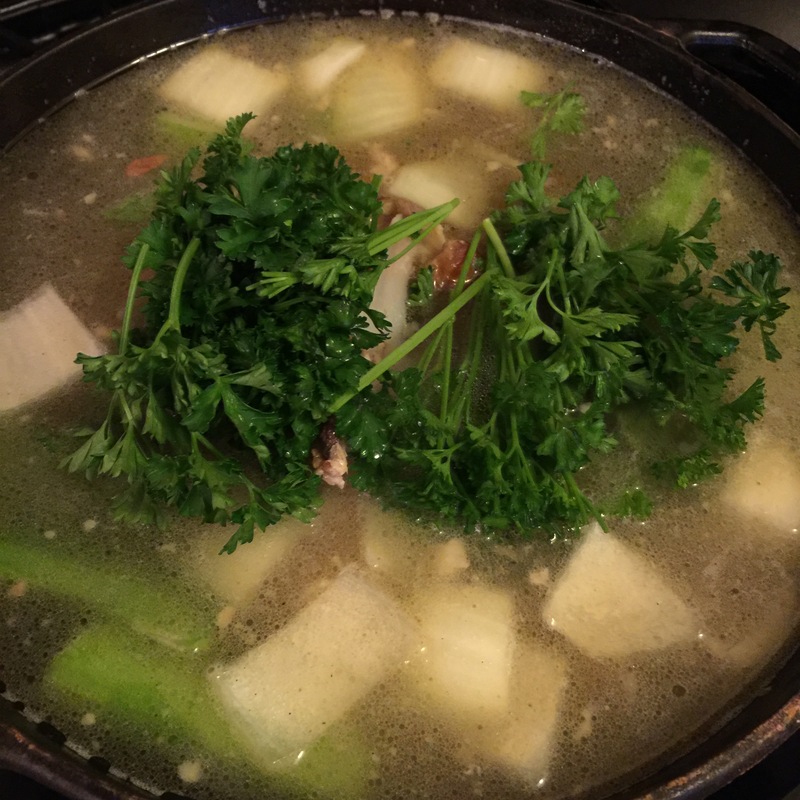 Now strain the remainder of the stock to separate out the stock from the cooked veggies and herbs. The vegetables and the herbs have done their job now and you don’t need them anymore. What you do need is the chicken stock that’s now been flavored and infused with all of the essence of the vegetables and the herbs. This one chicken carcass made two quarts of chicken stock for me. Now that you’ve got your chicken stock, it’s time to prepare to make the chicken noodle soup. I like my chicken noodle soup to have chunky vegetables in it as well as the noodles. 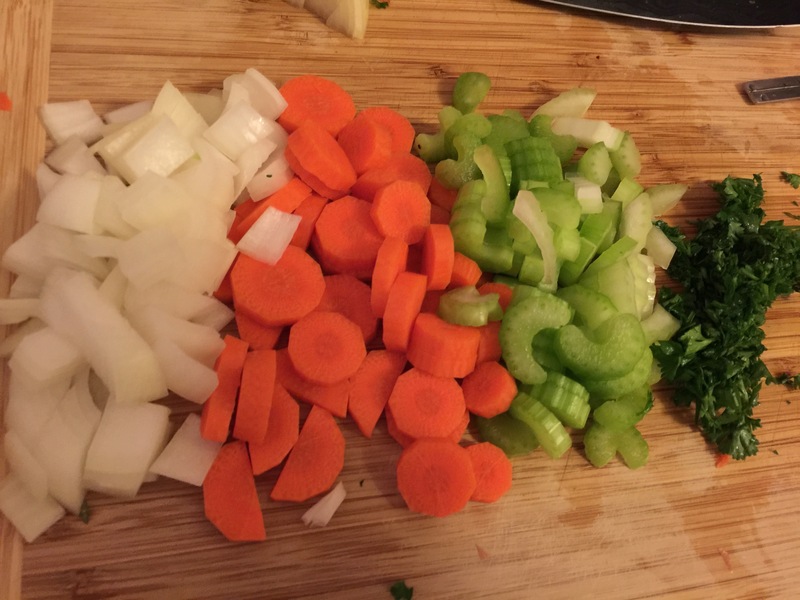 So, I prepared many of the same vegetables we used for the chicken stock: onions, carrots, and celery. Again, I also used a little bit of the fresh parsley I still had on hand. 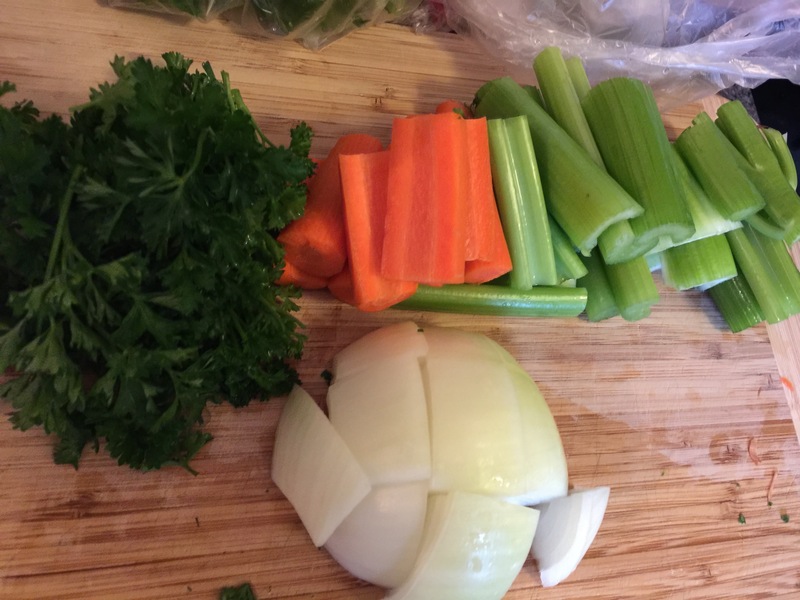 Since this is going into your soup and you’re going to be eating it, cut all the vegetables into bite sized pieces. Also, now is the time to cook the egg noodles for the chicken noodle soup. In a separate pot of boiling water, pour in just enough egg noodles for the amount of soup that you’ll be making and cook until al dente. Into a small pot on the stove, add in a couple of cups of the chicken stock we just made, throw in the vegetables for the soup, the onions, carrots and celery, and allow everything to come up to a quick boil. This will cook the vegetables to your liking it. Do you want softer, mushy vegetables then let it boil a little longer. If you want firmer, crunchier vegetables with a bit of a bite to them, don’t boil as long. Into the small pot, add in the chicken for your chicken noodle soup. Again, like the egg noodles, only add in enough chicken for the amount of soup that you’re actually going to make and enjoy. 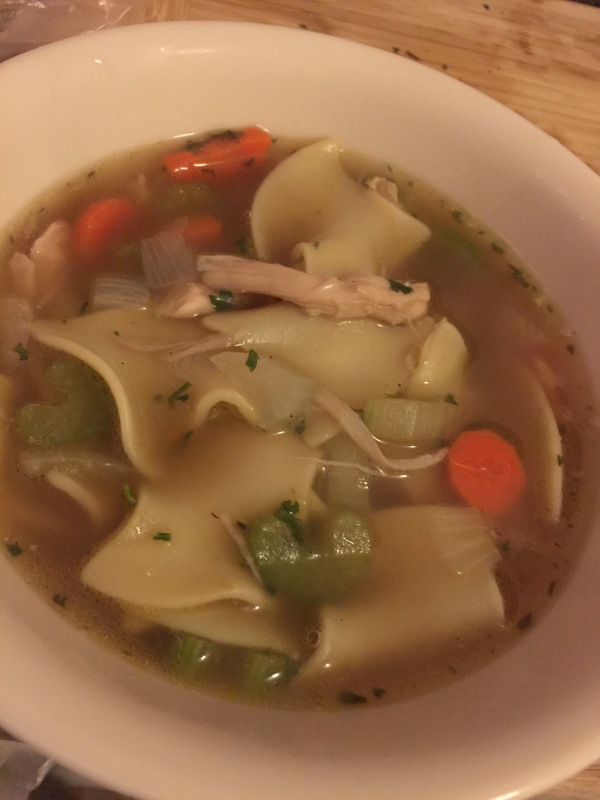 Once you’ve got the chicken stock prepared, making chicken noodle soup is quick and easy. So there’s no need to make pots and pots of it in advance. After you’ve added the chicken, the final touch is to add in the egg noodles that you’ve already cooked. Since the egg noodles are already done, there’s no need to continue cooking them in the pot with the chicken stock and the rest of the vegetables. So, you can turn off the heat to the pot as soon as you’ve added the egg noodles. Just stir everything to combine. Serve the chicken noodle soup right away in a bowl piping hot off the stove. You can see the beautiful egg noodles, the perfectly cooked and bite sized carrots, onions and celery, and the chunks of rotisserie chicken meat. 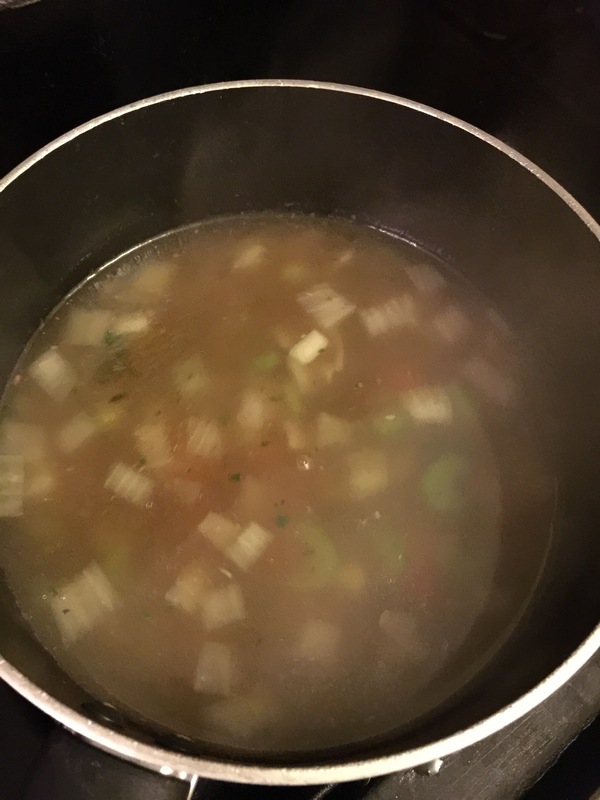 The flavor of the broth for the soup is perfect because you made it yourself. You know exactly what went into the chicken stock, the vegetables the fresh herbs, the peppercorn. There’s no added ingredients, no additives, just pure flavoring from the chicken and the vegetables. The chicken noodle soup was perfect and delicious. The broth was rich and hearty and filling and the soup hit the spot on a cold winter night. My husband was skeptical at first of my soup making skills, but once he smelled the soup and saw how good it looked, he even asked for a bowl of it himself.